How do you book your practical driving test? Visit this page, https://www.gov.uk/book-driving-test, to book your practical test, this if the OFFICIAL government website. I will let you know when to book your test, this will be when you are ready and will stand a great chance of passing first time! Once we have agreed you are ready for the test, go online to look for the test dates/times then please let me know what these are to ensure that I can do the time/date that you find. Also, avoid searching Google for "book practical driving test" or similar as the top hits are often non-offical sites and will charge you extra for booking a test. The gov.uk website will get you the practical test at the lowest fee. What can I expect on the day of my practical driving test? - Moral support / a friendly face in the back. - A second pair of eyes to watch what is going on, so should any mistakes take place i will be in the best position to help you work out what went wrong and we can then work together to find a solution to resolve the issues raised. I find that around 70% of my pupils ask for me to sit in the back due to the benefits stated above, but the other 30% prefer for me to stay at the test centre due to the disadvantages listed. NOTE - The examiner will treat the test the same if I am in the back or if I stay at the test centre. Also please note that if I sit in the back I MUST stay quiet and stay very still, like a statue! Every so often the examiners need to be assessed by a senior examiner to ensure they are doing their job correctly, maintaining standards and giving a fair result to the candidate (i.e. You! ), this can sometimes mean a senior examiner will sit in the back, if this happens it is important to remember they are there to watch and assess the examiner, not you! 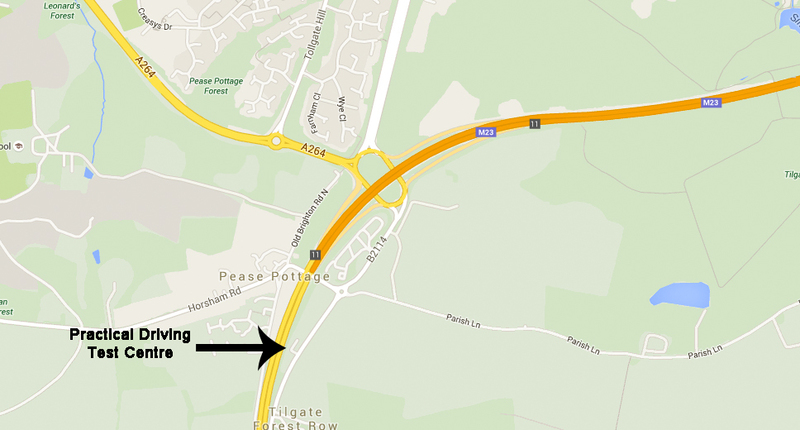 Where is the Crawley practical driving test centre? As you can see the test centre is in Pease Pottage, it is in a group of buildings called "The Pavilions", this is diagonally opposite Bridges Breakers Yard. When arriving at the test centre you will enter through blue metal gates, once you have passed the gates turn left and the bays for the test centre are the ones at the end, you will need to reverse into any one of these.